Welcome to Oceanside Dental Excellence! Your Oceanside cosmetic and general dentist. We deliver outstanding and personalized dental care at Oceanside Dental Excellence. 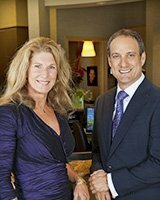 Dr. Stephen Dankworth and Dr. Kimberly Corrigan-Dankworth are a skilled husband and wife dental team. They use their extensive technical training and artistry to give each patient their best smile ever. If comfort is a concern, rest assured that our spa-like environment will put your mind at ease during your appointment. We offer warm blankets, chair pads, and even sedation dentistry options for patients with dental anxiety upon request. We provide the latest dental advancements to maximize your time with us. If you are looking for a high quality general, restorative, or cosmetic dentistry experience near Oceanside, Fallbrook, or Vista CA, please call, text, or contact our comprehensive dental practice using the form on this page. For beautiful dental crowns, you can trust our dentist. Oceanside, CA, patients with damaged, discolored, or decayed teeth can benefit from the strength of dental crowns. Dental crowns will improve both the function and aesthetic of your smile. Oceanside Dental Excellence is invested in a better patient experience. If you have dental anxiety or dental phobia, sedation dentistry will make your next visit tolerable and even relaxing. Sedation dentistry allows you to receive high-quality dental care without any of the discomfort or stress. We offer all of the sedation options patients need, including IV sedation! Invisalign is the ground-breaking orthodontic appliance system that inconspicuously treats imperfect teeth. You don’t have to change your look, your diet, or your daily habits to wear Invisalign. This convenient treatment system will give you the straight smile you have always wanted. When you need emergency dental care, can you lean on your current dentist? Oceanside, CA, patients can turn to Dr. Dankworth and Dr. Corrigan-Dankworth in their time of need for fast relief. When it comes to emergency dental care, we emphasize rapid pain elimination and long-term solutions. Your smile is our top priority! For the highest quality general dentistry that will keep you safe from deep dental decay, infection, and disease, contact our dentist. Oceanside, CA, residents will find a comprehensive selection of general dentistry services here that will meet your needs and preserve your healthy teeth.